Digital Citizenship is a hot topic right now, particularly when we look at more and more schools integrating technology. I know recently my school division has made a point of ensuring all teachers are integrating some Digital Citizenship Curriculum into their long-range plans. I make it a priority to start my year with an in depth unit around Digital Citizenship. 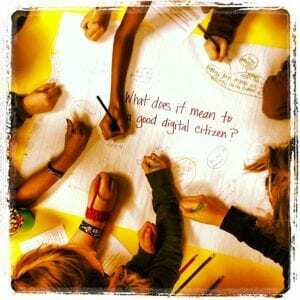 This unit includes what Digital Citizenship means, what it looks like, and how to be an active Digital Citizen. This is all great, but being a Digital Citizen does not mean that we are creating students who are necessarily empowered to become digital leaders, because I believe there is a difference. As I mentioned in my last post, the intention for my final project is to create a Responsible-Use Policy unique to parents, students, and teachers. In conjunction with two other teachers in this course, our hope is to train, empower, and educate all of the stakeholders involved in this project. My portion is specific to students. Currently our school division has students, or parents, sign an Acceptable Use Policy at the beginning of each school year. Teachers are then tasked with delivering this curriculum. Our division has done a great job of developing a program entitled “Digital Samaritans” where we take some of our religion education program and team it with some digital citizenship teachings. I feel these units do a good job, but not a great job at preparing our students for the digital world. As mentioned before, my goal is not only only educate my students on Digital Citizenship, but to also empower them to make positive choices when working online and in the digital world. I hope to accomplish this by giving students real-world experience utilizing digital tools and social media outlets. Students need the opportunity to practice in a safe monitored environment where they can make mistakes and learn from them safely. This allows students to gain confidence and an understanding of why their behaviour is so important in the digital world. Students are bound to make mistakes, and we need give them an environment where their mistakes are opportunities to grow. This is certainly no small feat! What are some of your ideas on how best to encourage students to become digital leaders, rather than simply being consumers of digital tools? How have you empowered your students to make positive choices and set an example for others online? Have you come across any tools to help support your venture? I am always looking for new ideas and tools that can best support my students in their digital learning experience! I look forward to hearing your ideas and hoping to include them into my proposed Digital Leadership Student Learning Program! Wish me luck! Final Project – Starting Point The International Level – What does the future hold?